This can koozie is as classy as they come! The ideal way to keep your favorite canned drink cold, our personalized black leather koozie looks high-brow and high-tech. Fashioned in black with silver-toned trim, this koozie is personalized with the name of the recipient and the date of the gift. 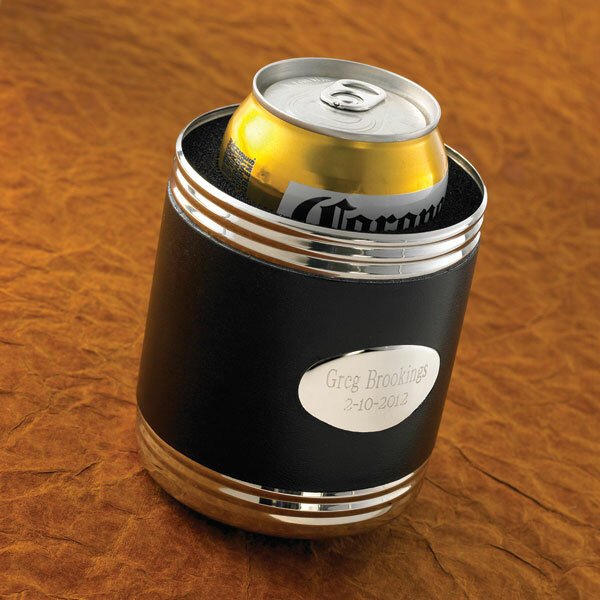 A great personalized gift for guys who enjoy a can or two of brew while watching the big game! Holds a 12 ounce (or larger can). Measures 4" x 3 1/2". Personalized with two lines of up to 15 characters per line. Allow 2-3 weeks for delivery. Item can only be shipped within the Continental US.